1,011. That’s the number of different Saccharomyces cerevisiae yeast strains that were whole-genome sequenced and phenotyped by a team of researchers jointly led by Joseph Schacherer and Gianni Liti, published this week in Nature (Peter et al., 2018; data at: http://bit.ly/1011genomes-DataAtSGD). Scrupulously gathering isolates of S. cerevisiae from as many diverse geographical locations and ecological niches as possible, the authors and their collaborators plucked yeast cells not only from the familiar wine, beer and bread sources, but also from rotting bananas, sea water, human blood, sewage, termite mounds, and more. The authors then surveyed the evolutionary relationships among the strains to describe the worldwide population distribution of this species and deduce its historical spread. They found that the greatest amount of genome sequence diversity existed among the S. cerevisiae strains collected from Taiwan, mainland China, and other regions of East Asia. This means that in all likelihood the geographic origin of S. cerevisiae lies somewhere in East Asia. According to the authors, our budding yeast friend began spreading around the globe about 15,000 years ago, undergoing several independent domestication events during its worldwide journey. For example, it turns out that wine yeast and sake yeast were domesticated from different ancestors, thousands of years apart from each other. Whereas genomic markers of domestication appeared about 4,000 years ago in sake yeast, such markers appeared in wine yeast only 1,500 years ago. Additionally — and similar to the situation where human interspecific hybridization with Neanderthals occurred only after humans migrated out of Africa — it appears that S. cerevisiae has inter-bred very frequently with other Saccharomyces species, especially S. paradoxus, but that most of these interspecific hybridization events occurred after the out-of-China dispersal. There are many more gems to be found among the treasure trove of information in this paper. Some notable conclusions from the authors include: diploids are the most fit ploidy; copy number variation (CNV) is the most prevalent type of variation; most single nucleotide polymorphisms (SNPs) are very rare alleles in the population; extensive loss of heterozygosity is observed among many strains. There are also phenotype results (fitness values) for 971 strains across 36 different growth conditions. As is often the case for yeast, the ability to sequence and analyze whole genomes at very deep coverage has yielded broad insights on eukaryotic genome evolution. The team’s work highlights this by presenting a comprehensive view of genome evolution on many different levels (e.g., differences in ploidy, aneuploidy, genetic variants, hybridization, and introgressions) that is difficult to obtain at the same scale and accuracy for other eukaryotic organisms. 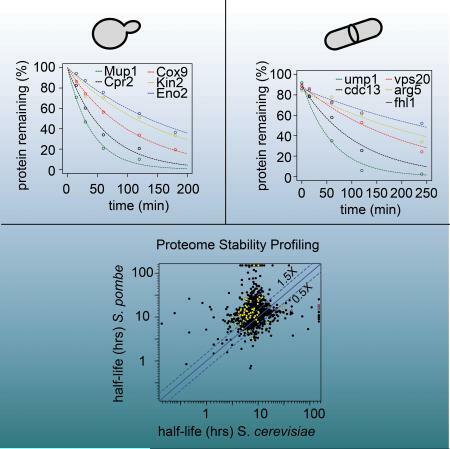 Protein turnover for budding and fission yeast proteins, and scatterplot comparing homologous protein half-lives. Image from Cell Reports via Creative Commons license. Ever wonder how quickly your favorite protein turns over within the cell? SGD has just incorporated half-life data for 3700 yeast proteins from a paper by Christiano et al., 2014. In this study, Christiano and colleagues pulse labeled exponentially growing wild type yeast cells in synthetic medium with a heavy lysine isotope (pulse SILAC), and followed the decay of native untagged proteins using high-resolution mass spectrometry based proteomics. The data generated in this study can be accessed by viewing the Experimental Data section of the Protein tab for your favorite gene, such as the short-lived Ctk1p or the long-lived Rsc1p. In addition, you can retrieve this half-life data using YeastMine for one or more proteins with the Gene–>Protein Half-life template or obtain a list of proteins with half lives within a given range using the Retrieve–>Proteins with half-life in a given range template. Both of these templates can be found in the “Templates” section of YeastMine under the “Protein” category. Thanks to Romaine Christiano and Tobias Walther for their help integrating this information into SGD. We’ve added 1,400 high-throughput (HTP) cellular component GO annotations from a new paper published by Maya Schuldiner’s lab. In this paper, Yofe et al., 2016 devised and implemented a methodology, called SWAT (short for SWAp-Tag), creating a parental library containing 1,800 strains, all known or predicted to localize to the yeast endomembrane system. Once created, this novel acceptor library serves as a template that can be ’swapped’ into other libraries, thus facilitating the rapid interconversion to new libraries by simply replacing the acceptor module with a new tag or sequence of choice. As proof of principle, this paper describes the parental library (N’ SWAT-GFP), and its utility as a gateway to the construction of two additional libraries (N’ mCherry and N’ seamless GFP). A high-content screening platform was used to generate images that were then manually reviewed and used to assign subcellular locations for proteins in these collections. Based on these results, SGD has incorporated GO annotations for proteins when at least two of three tags gave the same cellular localization. In addition, Locus Summary page descriptions for genes within this collection that did not have a known cellular location prior to this study have been updated. Finally, this study also provides access to a list of proteins predicted to contain signal peptides using three different algorithms. We would like to thank Maya Schuldiner and members of her lab for help with the integration of this information into SGD. Yeast and humans diverged about a billion years ago, but there’s still enough functional conservation between some pairs of yeast and human genes that they can be substituted for each other. How cool is that?! Which genes are they? What do they do? This two-minute video explains how to find, search, and download the yeast-human functional complementation data in SGD. You can find help with many other aspects of SGD in the tutorial videos on our YouTube channel. And as always, please be sure to contact us with any questions or suggestions. Yeast and humans diverged about a billion years ago. So if there’s still enough functional conservation between a pair of similar yeast and human genes that they can be substituted for each other, we know they must be critically important for life. An added bonus is that if a human protein works in yeast, all of the awesome power of yeast genetics and molecular biology can be used to study it. To make it easier for researchers to identify these “swappable” yeast and human genes, we’ve started collecting functional complementation data in SGD. The data are all curated from the published literature, via two sources. One set of papers was curated at SGD, including the recent systematic study of functional complementation by Kachroo and colleagues. Another set was curated by Princeton Protein Orthology Database (P-POD) staff and is incorporated into SGD with their generous permission. As a starting point, we’ve collected a relatively simple set of data: the yeast and human genes involved in a functional complementation relationship, with their respective identifiers; the direction of complementation (human gene complements yeast mutation, or vice versa); the source of curation (SGD or P-POD); the PubMed ID of the reference; and an optional free-text note adding more details. In the future we’ll incorporate more information, such as the disease involvement of the human protein and the sequence differences found in disease-associated alleles that fail to complement the yeast mutation. You can access these data in two ways: using two new templates in YeastMine, our data warehouse; or via our Download page. Please take a look, let us know what you think, and point us to any published data that’s missing. We always appreciate your feedback! YeastMine is a versatile tool that lets you customize searches and create and manipulate lists of search results. To help you get started with YeastMine we’ve created a series of short video tutorials explaining its features. This template lets you query with a yeast gene or list of genes (either your own custom list, or a pre-made gene list) and retrieve the human gene(s) involved in cross-species complementation along with all of the data listed above. This template takes either human gene names (HGNC-approved symbols) or Entrez Gene IDs for human genes and returns the yeast gene(s) involved in cross-species complementation, along with the data listed above. You can run the query using a single human gene as input, or create a custom list of human genes in YeastMine for the query. We’ve created two new pre-made lists of human genes that can also be used with this template. The list “Human genes complementing or complemented by yeast genes” includes only human genes that are currently included in the functional complementation data, while the list “Human genes with yeast homologs” includes all human genes that have a yeast homolog as predicted by any of several methods. If you’d prefer to have all the data in one file, simply visit our Curated Data download page and download the file “functional_complementation.tab”. SGD curators periodically update the chromosomal annotations of the S. cerevisiae Reference Genome, which is derived from strain S288C. Last November, the genome annotation was updated for the first time since the release of the major S288C resequencing update in February 2011. Note that the underlying sequence of 16 assembled nuclear chromosomes, plus the mitochondrial genome, remained unchanged in annotation release R64.2.1 (relative to genome sequence release R64.1.1). The R64.2.1 annotation release included various updates and additions. The annotations of 2 existing proteins changed (GRX3/YDR098C and HOP2/YGL033W), and 1 new ORF (RDT1/YCL054W-A) and 4 RNAs (RME2, RME3, IRT1, ZOD1) were added to the genome annotation. Other additions include 8 nuclear matrix attachment sites, and 8 mitochondrial origins of replication. The coordinates of many autonomously replicating sequences (ARS) were updated, and many new ARS consensus sequences were added. Complete details can be found in the Summary of Chromosome Sequence and Annotation Updates.